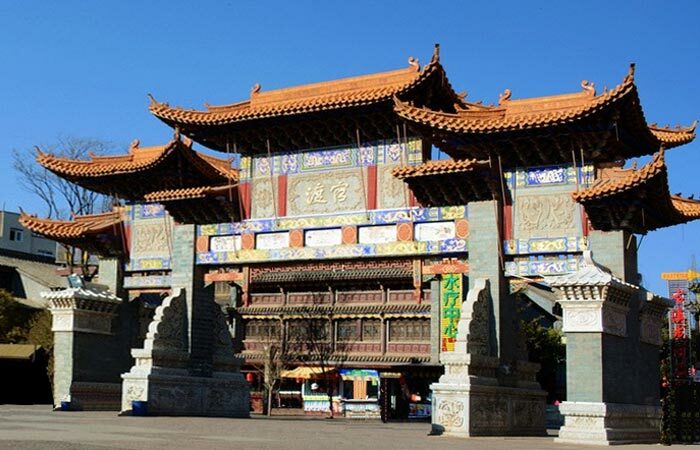 The gate of Guandu Ancient Town is located 8 kilometers southeast of Kunming. The town covers an area of 17 square kilometers. Guandu Ancient Town features many cultural relics and rich cultural landscapes. In an area of less than 1.5 square kilometers, you will find old buildings originally built in the Tang (618 - 907), Song (960 - 1279), Yuan (1271 - 1368), Ming (1368 - 1644) and Qing (1644 - 1912) Dynasties. Guandu Ancient Town was once a well-known ancient ferry in Yunnan. In the Yuan Dynasty, it was set as a county. In the Ming and Qing Dynasties, it had become a developed town in commerce and handicrafts. Guandu Ancient Town is a combination of old buildings, handicrafts workshops, and local food. Vajra-Based Pagoda is the oldest pagoda in Kunming. It consists of two parts: the base and the body of the pagoda. The plane of the base is square. The bottom of the base is hollow with four doors in the north, south, east and west. Five pagodas stand on the base. Surrounded by four smaller pagodas in the four directions, the main pagoda stands in the middle. The styles of the smaller pagodas and the main pagoda are different. Sculptures of five mount animals on the main pagoda, the Buddha statue in the Buddha's shrine and the four Buddha's warriors on the four smaller pagodas are exquisitely carved. If interested, you can visit the Confucius Temple, Fading Temple, Earth Temple, Wenming Pavilion, Kuixing Pavilion, Guanyin Mountain, Yuntai Mountain, Luofeng Mountain and Tuzhu Temple originally built in the Tang Dynasty. Yunnan Chinese Chess Museum, Carved Copper Workshop (乌铜走银传习馆), and Yunnan Opera Workshop (滇剧花灯传习馆) offer you a great chance to get acquainted with the local culture. At the town, you will find locals making the famous flower cakes with rose petals and petals of other flowers. At Miaoxiang Folk Custom Old Street (妙象民俗老街), some articles with local ethnic characteristics such as portrait puppets, wind chimes, feather handicrafts, sugar paintings, and ethnic costumes are on display. In addition, you can try local cuisine at the old town as well. If you are planning to visit Guandu Ancient Town for photography purposes, the best time to visit is in the evening. A few buses get to Guandu Ancient Town. Therefore, there are a few options. Rent a vehicle to the town. This is the quickest and most direct option. Take Bus 31, 165, 169, 174, 185, 908, and Bus k15 to the Stop of Guandu Guzhen (官渡古镇). As at 11th January 2019, the entrance pricing is free of charge. Interested in visiting Guandu Ancient Town on a Tour? Wendy Wei Tours offers a variety of different packaged tours as well as custom tours including Guandu Ancient Town, among other attractions and destinations. To find out more, please visit our Tours page or Contact Us directly to find out more.